It's been a few weeks since I shared my current makings with you all, and as a result there are several to show. A couple are completed and a couple are works in progress. Firstly there is Calum's ripple blanket. 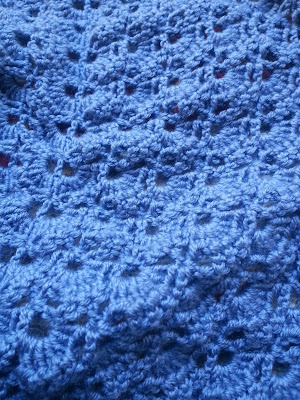 If you cast your minds back to the end of last year you might remember me sharing the beginning of this blanket. Calum (12) chose the colours himself and asked for a ripple pattern. 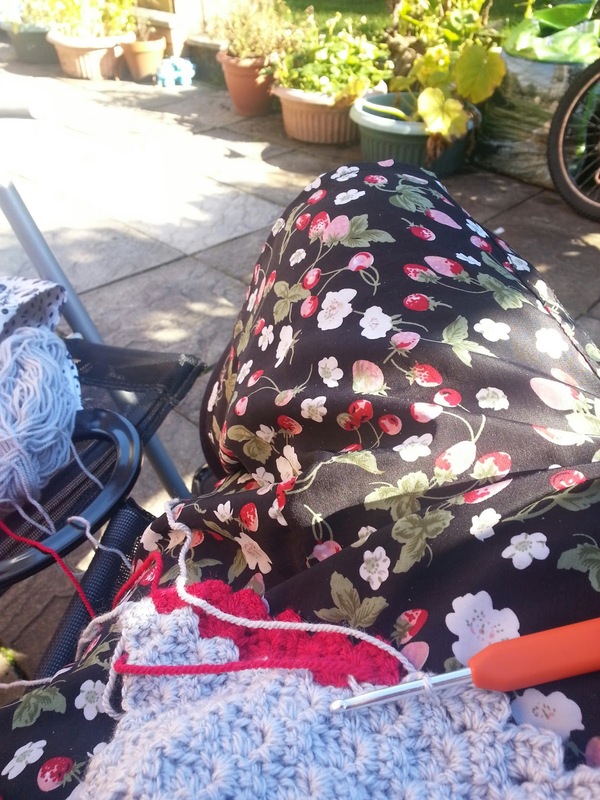 I made a start and then got sidetracked by my Cosy Blanket, see here, which since it was for everyone, I decided to finish first. I promised him that I would get started on it in earnest again after the summer, and once I'd got a few more projects out of the way I picked it up again. I think it's nearly half way there, and by my rough calculations, if I do four colours a day it will definitely be finished by the end of October. He has asked if it can please be ready by the time the weather gets cold, so I think late October to mid November is a good target. Aren't the colours he chose lovely? Really fresh and cheerful. One of my competed projects is one that I can't share too much of at the moment until it is gifted. I took part in an Autumn Shawl Swap on Instagram and here is a peek at my completed shawl. The rules of the swap stated that the shawls had to be made of 4ply or sock yarn, something I don't use very often as it takes longer to work up! I found this beautiful soft cashmere and silk mix yarn though, and it only took me about 3 weeks working on and off to complete the shawl. I'll share the full thing once it has been received. Another completed make is my Autumn wreath. I never did get around to making a summer one and so my daffodil Spring wreath has been hanging in our living room all summer. Since it doesn't feel like we had a proper summer anyway, maybe that's not such a big deal! I did think that the daffodils were long past their season though, and so I wanted to get the Autumn wreath up quickly. Instead of crocheting around the wreath I wrapped the yarn around it. 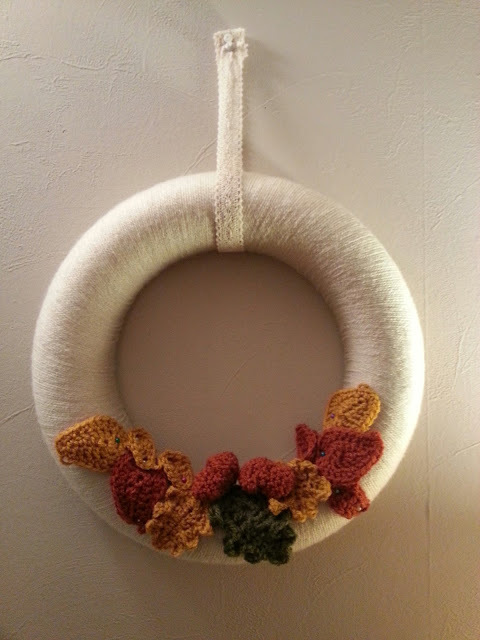 It still took quite a while to cover the wreath with yarn but not as long as it would have done to crochet. Then I found a few patterns for leaves and acorns in a crochet magazine and crocheted up a bunch of them in various autumn colours. I used Stylecraft Special DK and the colours used are: parchment for the wreath, copper, gold and khaki. I love how cosy it looks but don't look too closely at it, as in my haste to hang it up I didn't quite get around to sewing all the leaves on so some are held on by pins! Perhaps I should disguise those pins as Autumn berries until I get them sewn on properly! Finally my other incomplete project. The deadline I have given myself for this one is the beginning of December as it's a Christmas decoration. 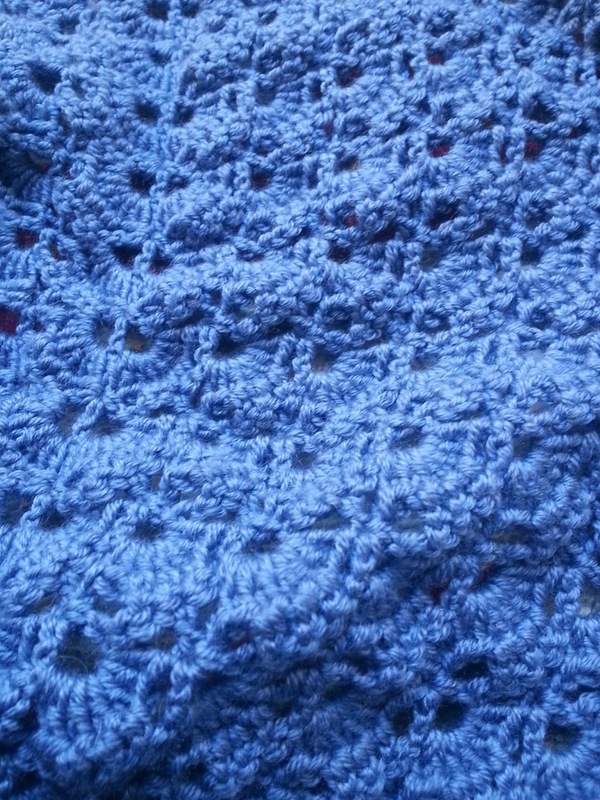 The squares are made using the corner to corner (c2c) technique, something I had never tried before, and for the pattern you just follow the graph, again something I had never tried before. 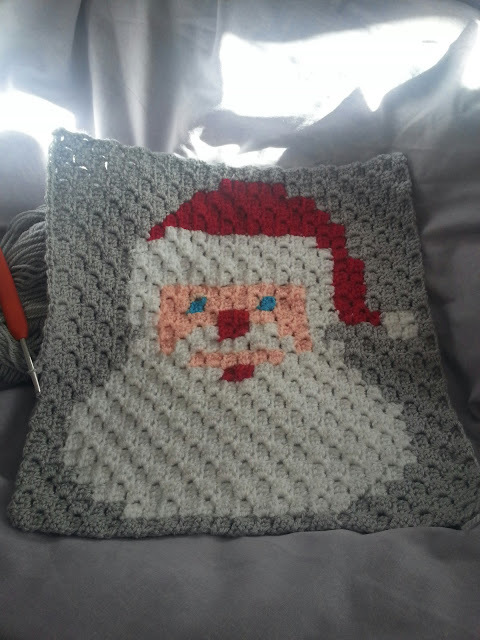 Since I loved the idea of the blanket so much I decided a few weeks ago just to jump in and see how it went with the Santa square. As you can see it actually went pretty well. Working from a graph is not at all as scary as it sounds and the c2c technique is indeed as simple as everywhere online says it is! It does take a little bit of thinking to decide if you need to carry your yarn across a few squares or just drop it and pick up a new section of the same colour but this isn't as complicated as it sounds and is the sort of thing that you can't work out until you are actually working on the square. The other beauty of working on squares like this from picture graphs is that as the picture begins to show in your crochet it becomes very addictive and you are eager to keep going to reveal more of the picture. 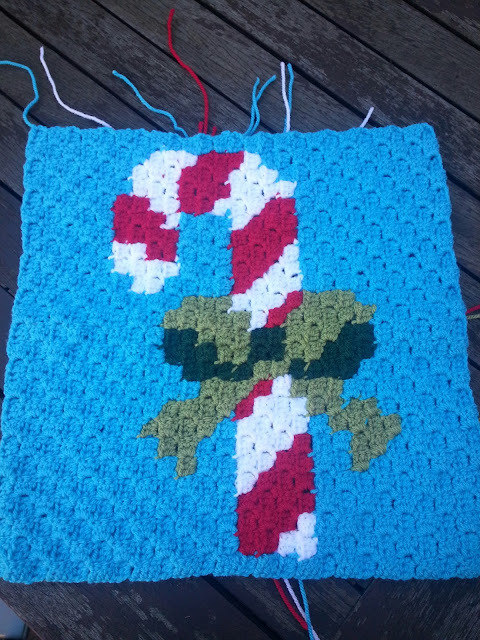 After completing Santa, and working on a few more rows of Calum's blanket, I worked up the candy cane square. Next up, and started in the sunshine yesterday, is the Christmas stocking. 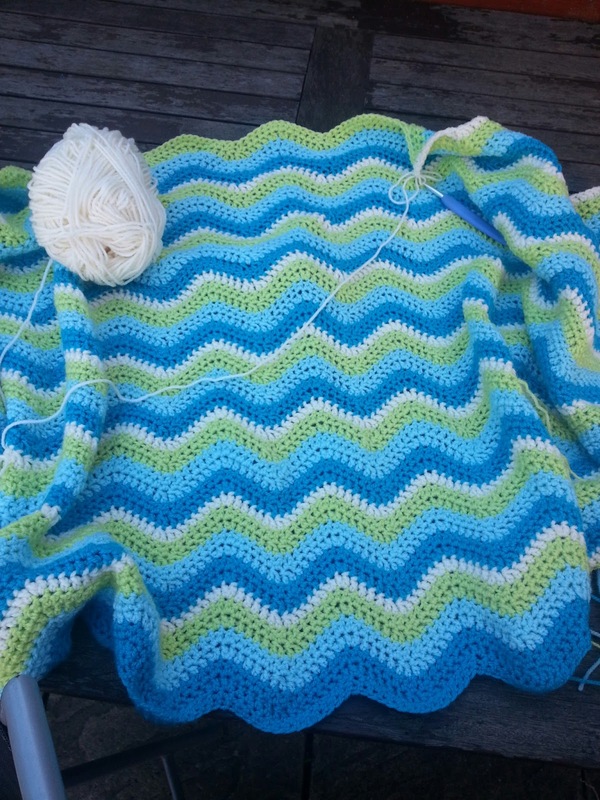 Sarah has shared her completed blanket on her blog and it includes a top and bottom banner, worked in the same c2c graph technique, that reads Merry Christmas. 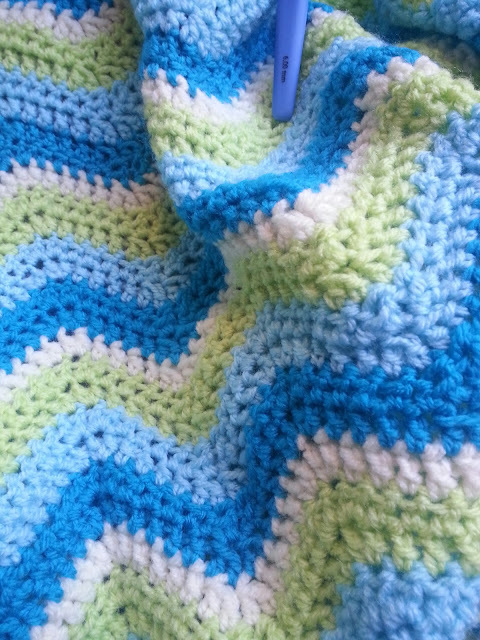 I'm under absolutely no illusions that I will have time to add that to my blanket though! In fact, when I first decided to try this blanket I thought I would only work up a selection of the characters and alternate them with solid coloured squares which would work up much quicker. Now that I've made more than one character though, I've caught the bug and am keen to get most, if not all, of them made. I guess we'll just have to wait and see how many I manage to get done in time! 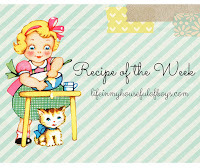 I started the Repeat Crafter Me Christmas one, but I have so many things on the go now, I put it aside. Seeing yours makes me want to pull it out again! Beautiful stuff! 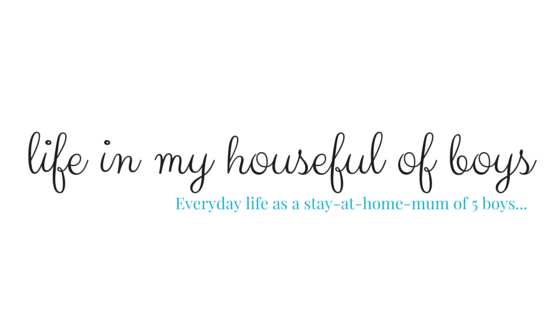 Love the simplicity of the wreath! 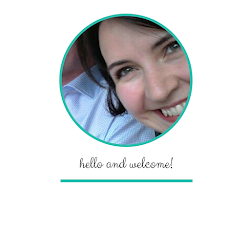 I am loving all of your projects Kirsteen. The blanket and shawl are lovely. I have never tried the corner to corner c2c technique either… I just love the project. I look forward to seeing yours all finished.